Want to learn more? Start with the Web. Adventure Divas unites adventure, travel and modern-day heroines to create fresh new media for television and the web. Home base is Seattle; here, the divas travel to Cuba. In wartime Los Angeles, the murder of a young Mexican-American man ignited a firestorm. The "zoot-suited" suspects were rebellious kids who refused to play by the old rules. Get the whole story on the Web site, available in English and in Spanish. Considered the greatest Mexican painter of the twentieth century, Diego Rivera had a profound effect on the international art world. Find out more about the life of this celebrated Mexican artist. Looking to discover your roots? This web site companion to the PBS series includes explanations of geneology records, as well as numerous links to web resources. While the U.SMexico border is a region all its own, the stories of border life in San Diego and Tijuana differ from the stories of the numerous border towns explored in this series. Explore contemporary life in these unique communities. Join host Ry Cooder and his musical guests on the web site companion to this acclaimed documentary. Explore the rich rhythms of the featured Cuban ensemble, the Buena Vista Social Club. La Ciudad tells stories of loss, love, frustration, and hope as four recently arrived Latin Americans struggle to build their lives, their communities and their dreams in their new home, the city. Michael Wood leads an exploration of the history of the Spanish conquistadors, who arrived in the New World 500 years ago. Features include pieces on Cortes, Pizarro, Orellana, Cabeza de Vaca, and many others. Learn more about the Spanish-American War and the film, Crucible of Empire, on this site, which offers a timeline of the major events before, during, and after the war; original 1890s sheet music popular during the War; photographs of the major figures involved; newspaper articles and headlines from 1890s newspapers; and more. The heart of the UFW, Cesar Ch�vez remains the most important Latino leader in this country's history. The activities he and his dedicated organizers led inspired the Chicano activism of the 1960s and 70s, helping create a Latino civil rights movement. Meet Chavez and learn about the United Farm Workers struggle that caught international attention. Food for the Ancestors is a culinary-history exploration of Days of the Dead, Mexican traditions and ancient ways of life that still exist there. All of these seen through Mexican cuisine. The program is set in the state of Puebla because it is also a place where the contrasts between new and old are vividly seen. Let filmmaker Hector Gal�n take you on an eye-opening journey to south Texas colonias. Colonias are American communities where hope resides despite the fact that the streets have no names, and often there is no running water or electricity. 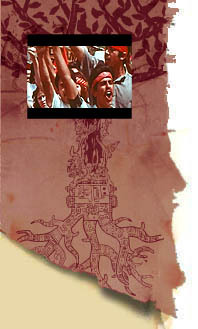 In October 1997, ITVS, the Independent Television Service (ITVS), presented Carlos Avilas Foto-Novelas, a four-part series of original dramas inspired by the fantastic elements of the Mexican and Latin American pulp novel tradition, where everyday reality is woven with other world surrealism. This innovative and entertaining series of four half-hour dramas was produced, directed, written and performed by established and emerging talents from across the spectrum of the Chicano and Latino artistic community. Elizabeth is marrying Artemio in Nuevo Leon, Mexico, and you are cordially invited to the wedding. Meet these two young people from the U.S.Mexican border region, whose lives are framed by the challenges of migrant life. In this absorbing film, the wedding becomes a touching evocation of migrant life, girlhood and the enduring strength of family tradition. A moving follow-up to "La Boda." The saga of the Luis family continues as Liliana Luis, a Mexican-American teenager, rushes headlong into the turbulence of puberty while trying to hold on to her Mexican heritage. The debate about race in this country is no longer about how race is defined. Today, the most-asked question is: how is it lived? "Matters of Race" not only looks into the personal experiences and relationships that affect this crucial debate, but also the institutions and structures that sometimes make it seem so difficult to change language, ideas and practices. "Lost in Translation: Latinos, Schools and Society." Debates over bilingual education. In vivid verit� detail, My American Girls: A Dominican Story captures the joys and struggles over a year in the lives of the Ortiz family, first generation immigrants from the Dominican Republic. The film captures the rewards  and costs  of pursuing the American dream. Through the intimate stories of a diverse group of immigrants and refugees, The New Americans captures the lives of contemporary immigrants in all their complexities. The New Americans puts a human face on the breadth and scope of immigrants and refugees experience in America  not just the sensational stories that make headlines. This discussion of ethnicity and what it means to be Latino includes Professor Clara Rodriguez of Forham University, author of Changing Race: Latinos, the Census and the History of Ethnicity in the United States; Samuel Betances, a professor of sociology at Northeastern Illinois University; and Ilan Stavans, a professor of Spanish at Amherst College and author of Tropical Synagogues: Short Stories by Jewish Latin American Writers. "Remember the Alamo" explores the life of the famed Tejano leader, Jos� Antonio Navarro, and his efforts to protect the sovereignty of his homeland as it passed through the hands of multiple governments. During the 1999/2000 school year, six young filmmakers followed 15 teens through their last year at Fairfax High, a school at the epicenter of the explosion of diversity reshaping L.A. and the country. The result, "Senior Year," is an entertaining, provocative, and inspiring portrait of a generation on the verge of creating a new world. Stealing Home explores Cuban baseball at the beginning of a new century as a country struggles to preserve not only a dated revolution, but also a important symbol of its viability. This documentary presents Cuban baseball to American audiences in a way that has not been previously considered: It focuses on the role the Cuban National League plays in the society, and how that prized position is jeopardized by the recent player defections. The U.S.Mexican War web site is a study in the way humans access, process, agree and disagree in the search for truth as it chronicles the war through multiple perspectives from both sides of the conflict. Within the site, you will find a series of conversations with and essays by historians and other experts, a timeline that illustrates war-related events and a discussion arena where we you can share your own viewpoints on the U.S.Mexican War. Self Help Graphics & Art, Inc. is a community based visual arts center located in the heart of East Los Angeles. SHG was started by a small group of local artists working out of a local garage in the early 1970s, for the purpose of creating art that reflected the rich cultural values and spirit of the local Chicano community. Over the past 26 years, Self-Help Graphics has emerged as the leading visual arts institution serving the predominantly Chicano/Mexicano community of Los Angeles. Founded in 1976 by muralist Judith F. Baca, painter Christina Schlesinger, and filmmaker Donna Deitch, the Social and Public Art Resource Center (SPARC) is a multi-ethnic arts center that produces, distributes, preserves and documents community based public art works. SPARC espouses public art as an organizing tool for addressing social issues, fostering cross-cultural understanding and promoting civic dialogue. Working within this philosophical framework for the last 25 years, SPARC has created murals in almost every ethnic community in Los Angeles. Muralist Judith F. Baca makes her web home here at JudyBaca.com. The web site includes Ms. Baca's biography and mission statement, numerous examples of her artwork, links to other web sites, works of art for sale, and even an audio introduction from the artist herself. LPB provides a voice for America's diverse Latino community. Nurturing and supporting Latino artists who portray the Latino experience in film, video, radio and other electronic media, LPB provides funding and a distribution mechanism to help present Latino programs on public television. The National Association of Latino Arts and Culture (NALAC) is a tax-exempt, non-profit, arts service organization that provides technical assistance and capacity building services to community-based Latino arts and cultural organizations, and advocates and promotes Latino arts and culture in the United States. With approximately 115,000 members throughout the United States and Puerto Rico, LULAC is the largest and oldest Hispanic Organization in the United States. LULAC advances the economic condition, educational attainment, political influence, health and civil rights of Hispanic Americans through community-based programs operating at more than 600 LULAC councils nationwide. The organization involves and serves all Hispanic nationality groups. MANA was founded in 1974 as the Mexican-American Womens National Association. MANAs original intent was to provide a voice for Mexican-American women at the national, state and local levels. Since then, the organization has expanded into a diverse group of Latinas in all areas of political, social and professional fields. MANA is unique since this makes MANA the single largest pan-Latina organization in the United States. The National Latino Childrens Institute (NLCI) is the only national Latino organization that focuses exclusively on children. Incorporated in 1997 in Texas, NLCI has its headquarters in San Antonio and is a nonprofit, nonpartisan, tax-exempt organization. NLCIs mission is to serve as the voice for young Latinos. The National Hispanic Council on Aging (NHCoA) was founded in 1980 in Washington, D.C., as a national membership-based organization. It is dedicated to improving the quality of life for Latino elderly, families, and communities through advocacy, capacity and institution building, development of educational materials, technical assistance, demonstration projects, policy analysis and research. Generations United (GU) is the only national membership organization focused solely on promoting intergenerational strategies, programs, and public policies. GU represents more than 100 national, state, and local organizations representing more than 70 million Americans and is the only national organization advocating for the mutual well-being of children, youth, and older adults. Founded in 1975, AHA is a not-for-profit organization dedicated to the advancement of Latino arts and artists in the United States. Its mission is to foster an appreciation of Latino arts and culture as an integral part of America's diverse cultural landscape. AHA is based in New York City, and reaches out to both a regional and global audience.